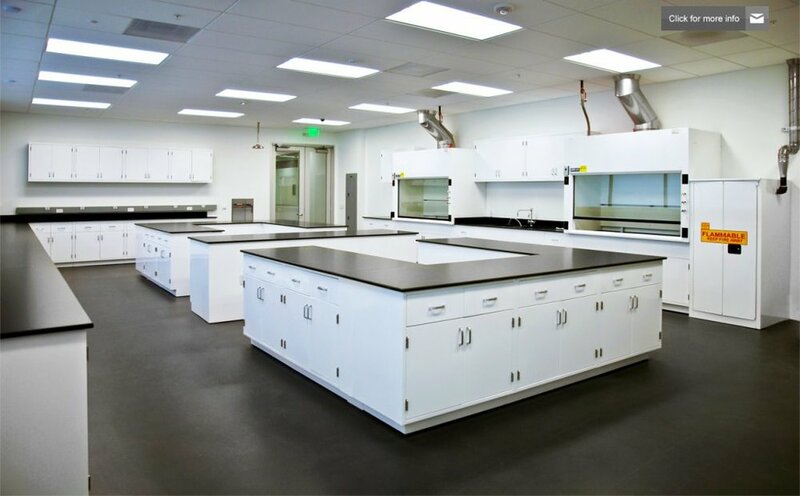 When you are in the process of designing a laboratory space, maximizing storage should be one of your top priorities. You need to be able to keep your workspace clear while also having quick access to the equipment and materials needed to conduct your research and experiments. Shelving plays a vital role in the design of your lab because it enhances organization and the overall efficiency of your team. However, how do you know which type of shelving will work out best in your lab? From overhead shelves, to laboratory cabinets, to shelves built into workbenches, there is a solution that allows you streamline workflow and make it easier for your team to get work done in your lab. The best part of lab planning is that you have the opportunity to install custom storage units to accomplish your goals. Overhead shelving provides you with a solution that greatly improves lab organization. Not only does it move chemicals and samples off your workspace, it also allows you to create a system that maps out the exact location of these items in the lab. This saves valuable time so your team doesn’t need to blindly search for what they need. – Free up premium space on counters and store items that aren’t frequently in use. – Everything has its place and can be cataloged so it is easily found when needed. – As your needs change in the lab, shelves can be reorganized to store a variety of tools and items for your new project. In addition to overhead shelving, incorporating shelves into your cabinets and workbenches allows your lab to utilize all available space and give it a purpose. Hybrid laboratory cabinets combine traditional upright cabinets with multiple drawers of different sizes so you can combine your storage solutions and cut down on your workspace’s overall footprint in your lab. These types of cabinets are great for shared-use labs or classroom environments that see a number of different groups working on a variety of projects and experiments. Each cabinet can be used to store materials and equipment for each group securely, keeping it out of the way when not in use. The same strategy can be used with custom workbenches for your lab. Using the same concept of a hybrid cabinet, your workbench can feature a smaller cabinet space with a variety of drawers made to suit your needs. Mobile cabinets go a step further by allowing you to remove and reorder shelves and have power in a unit that can be added to or removed from your lab based on your needs for that project. Learn more about the ways to maximize the value of your shelving while minimizing costs by contacting a representative of Genie Scientific today at (800) 545-8816.